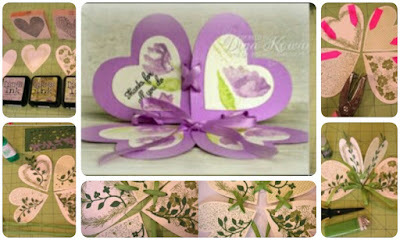 This tutorial is a Four leaf clover card, its nice and fun to use for other occasions and holidays as well. You can make the card flat, or pull the ribbon tight to make different shapes. Ink & stamps to decorate each panel (Distress inks & Memory Box stamps used here)Tips: we can substitute above with patterned paper to make it easier. Upholstery needle (optional)This tutorial is a Four leaf clover card, which is great for St. Patrick’s Day, but would be nice and fun to use for other occasions and holidays as well. You can make the card flat, or pull the ribbon tight to make different shapes.